Depending on the range of decades, the data is missing discrete population values for ages greater than a certain age. Instead an aggregate amount is provided that represents all ages greater than the cutoff. The desired outcome is to have discrete data points for each age and year from 0-99 and then an aggregated lump sum figure for ages 100 and greater. Therefore I want to input the missing discrete population values for ages 85 to 100 for years 1940 through 1979 and years 2000 through 2010. And I want to use the actual discrete population values for ages 85 to 100 for years 1980 through 1989 to achieve that outcome. 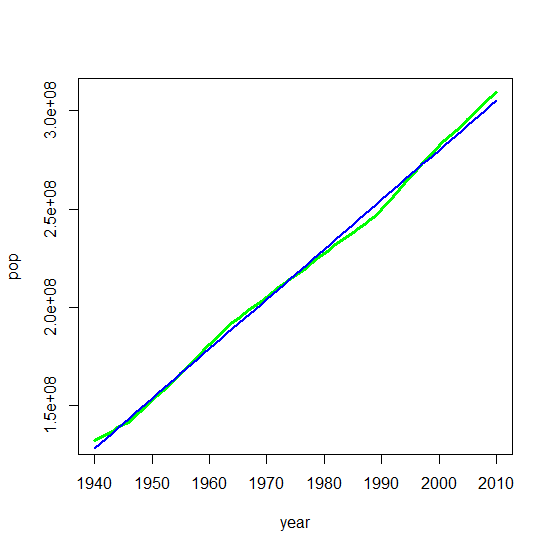 Population data for this time frame is deterministic: Population levels rise linearly each year; The duty cycle of a human body is finite and constraints and limits are well known. Then if we focus on the years 1980 through 1989 we can fit a nice curve for ages 0 through 100 with a Multiple-R-Squared of .979. Then if we narrow the focus to ages 60 to 100 and even narrower to ages 85 to 100 the Multiple-R-Squared increases to .9996. Now if we flip our focus and look at the increasing levels of population we can observe that these relationships are linear. Population rises at a steady rate year over year. Ages 85 through 100 for years 1980 through 1999. Each age is linear. 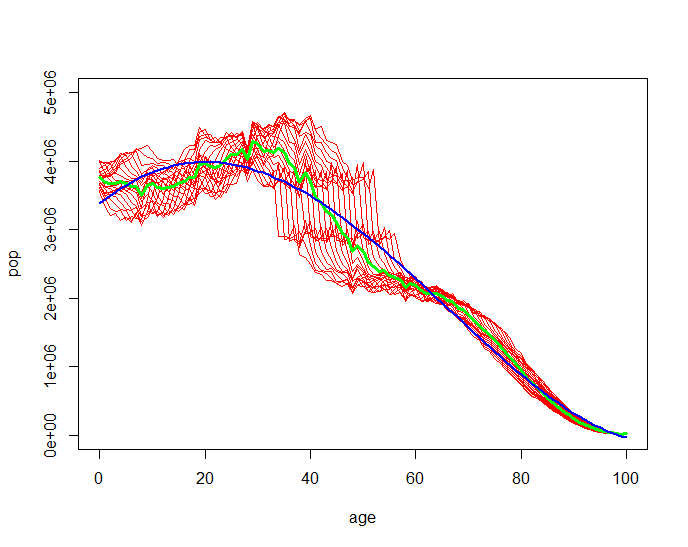 Each age has a slightly lower rate of increase (lesser slope). 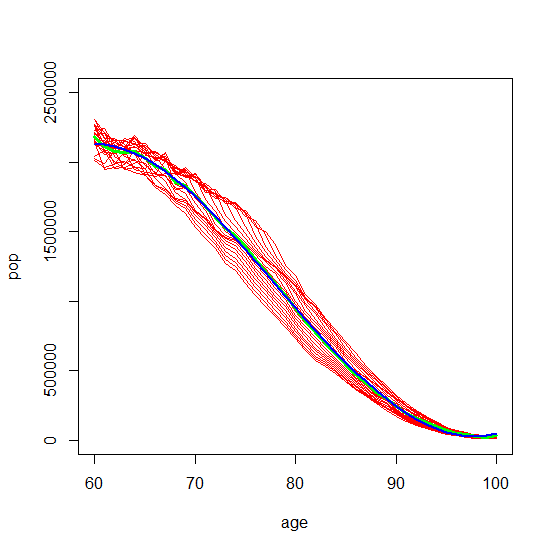 When imputing discrete missing population values by age and year, how do I combine the fitted curve that models changes in population when age increases with the linear regression that models changes in population year over year? Does one or more documented methods naturally apply to the problem as I have described it? For example: KNN, PCA, BPCA, Mean, MICE, other? If there is recommended method can you point me to available R or Python packages and documentation that describes the mechanics of applying a given approach? 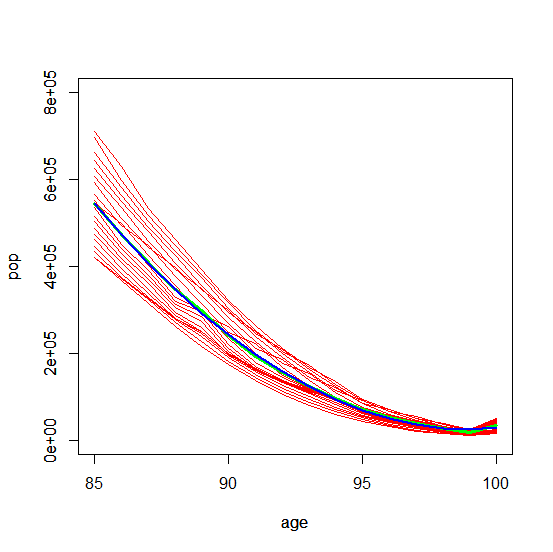 mortality increases with age; I would imagine it increases at an increasing rate with age (especially at higher ages). Would you be able to capture this effectively? 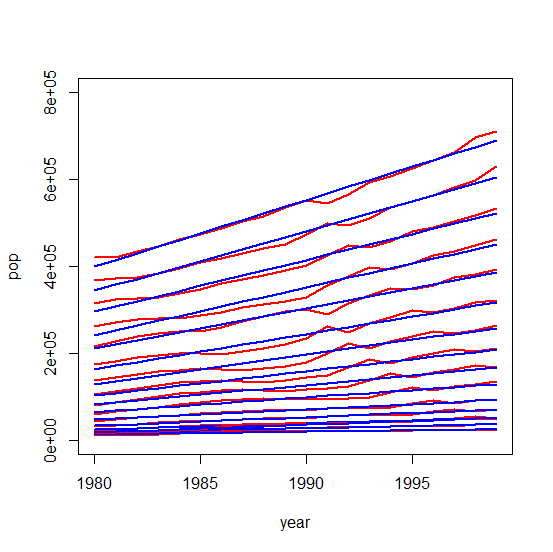 there is obviously some sort of overlap between populations in subsequent years (e.g. someone who is included in 1985 data could also be in 1986 data). What effect would this have on the data imputation? I would suggest a different approach. Actuaries have traditionally produced "life tables" which capture mortality in population cohorts. If you can find a set of tables which is applicable to the period in question, you could use these to calculate population numbers. Not the answer you're looking for? Browse other questions tagged r missing-data data-imputation or ask your own question. 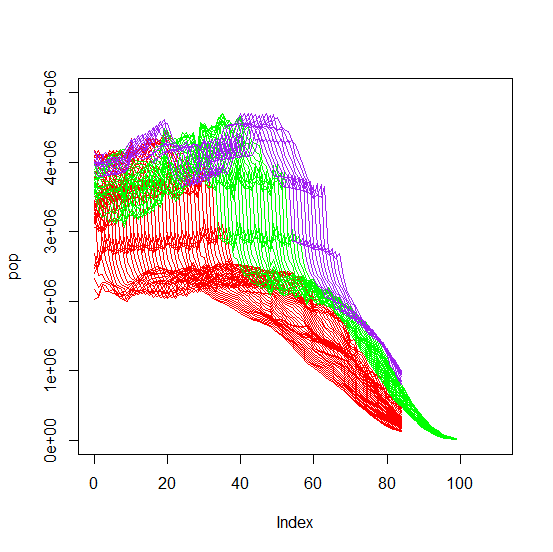 R tutorial for multitask regression tree for missing value prediction? Does encoding missing values help?